How can I get my clothing cleaned during my cruise? Most cruise lines offer wash and press services onboard their cruise ships for a fee. Exceptions include smaller lines, such as Island Windjammers. There is typically a laundry bag located inside your stateroom that you can leave for your room steward to pick up. Some cruise ships also have small do-it-yourself launderettes. How much does it cost to have your laundry done? Prices for laundry vary by cruise line and by item. Expect to pay a few dollars for a men's shirt or women's blouse to be washed and pressed, and slightly more for dry-cleaning. Just having an item pressed is usually available for a smaller fee. On Carnival, a shirt or blouse will cost $6 to dry-clean, $5 for wash/press and $4 for press only. On Oceania Cruises, it costs $3.50 to wash and press or dry-clean a shirt or blouse. Are there laundry packages available? Some cruise lines offer laundry packages, but most have to be booked and paid for in advance of your cruise. For example, Paul Gauguin offers an unlimited wash-and-press package costing $109 per cabin for a seven-night cruise, but it must be booked and paid for at least 24 hours before sailing. Some lines, including luxury line Seabourn Cruises, will charge a flat rate for as many items as you can fit into the laundry bag. Seabourn charges $50 per bag, and all items are hung in your closet upon return. Many times, cruise lines will offer laundry specials toward the end of a sailing, providing a discounted rate for a filled bag of laundry. How long does it take to get laundry done onboard? This varies by line, but check specified pickup times for your ship. If a laundry bag is picked up in the morning, it is typically returned by the next day. Express service is available on many ships, offering same-day delivery of your clothes for an additional fee. Do cruise lines guarantee my clothing will come back undamaged? No, cruise lines do not guarantee the state of clothing after being laundered. Very few people report damaged items, but it does happen. Check with your line for their individual liability policy, but reporting the lost or damaged item while still onboard will help your case (and may be mandatory for compensation). On Norwegian, for example, liability is limited to ten times the price charged for cleaning/pressing of said lost or damaged article (determined on a case-by-case basis). The line is not responsible for shrinkage, fastness of colors, zippers or for articles left in clothing. I'm allergic to certain detergent; can cruise lines accommodate my needs? Laundry is grouped together. Your clothing will be marked to identify it as yours. Is there an iron in my cabin or can I bring my own? Irons or anything with heating elements (except styling tools, such as curling irons) are not permitted in cabins. If your ship has an onboard self-service laundry facility, there are irons and ironing boards available for use there. Otherwise, most ships will have a few irons to loan upon request for a few hours at a time. Contact housekeeping or guest services to inquire about borrowing an iron. I'd rather do my own laundry. Can I do that on any cruise ship? No, not all cruise ships have self-service laundry rooms. The ones that do may charge per load and for use of detergent and dryer sheets. Carnival offers launderettes for about $3.25 for each washer or dryer load; detergent and water softener will run you $1.50 a box. On some ships, you'll need to swipe your keycard to pay for laundry; others require quarters. Disney's self-service laundry rooms run 24 hours and cost $2 per load and $1 per box of detergent or fabric softener. Holland America only offers self-service laundry on select ships. Royal Caribbean and Norwegian Cruise Line don't offer the ability to do your own laundry at all. What about dry-cleaning and pressing? Dry-cleaning is an option on almost all mainstream cruise ships, but it's usually not available on riverboats and smaller oceangoing vessels like expedition ships. 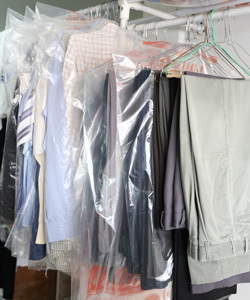 Having an item dry-cleaned will run you more than a simple wash, and the price will also depend on whether it's a single item like a pair of pants or a full suit. As an example, on Royal Caribbean, a women's blouse costs $4.50 to dry-clean, while a men's formal shirt costs $4. Most items should be eligible for a press for just a few dollars. On Royal Caribbean, the charge is $1.75 for an item to be pressed. Is there a way to get my laundry done for free? 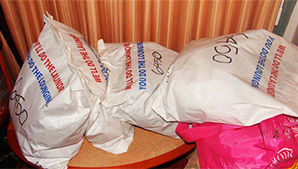 Many cruise line loyalty programs offer a free bag of laundry per cruise at a certain level. Princess Cruises' Captain's Circle Elite members receive complimentary laundry and professional cleaning services. If you're a passenger on a luxury line staying in an executive suite (a Penthouse on a Crystal Cruises ship, for example) you might be eligible for suite perks, such as complimentary laundry services that include dry-cleaning. Another free option is to do it yourself. There are no liquid restrictions on cruise ships, so you can bring your own detergent and hand-wash your clothes in the cabin sink. 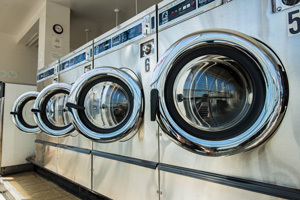 How can I learn more about laundry services on cruise ships?